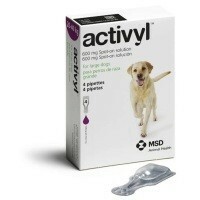 Activyl Spot-On Solution for Large Dogs is a highly effective innovation for the treatment and prevention of flea infestations in large breed dogs weighing 20-40kg. The solution contains the active substance Indoxacarb which works using a process called bio-activation. This mode of action uses enzymes inside the flea to activate and produce an active compound that interferes with the flea’s nervous system. Activyl Spot-On Solution for Large Dogs can also be used as part of a treatment strategy for the control of Flea Allergy Dermatitis (FAD). Each 3.08ml pipette contains 600.60mg Indoxacarb.